Cork is a city in County Cork in Ireland. It is the country's second largest city, only Dublin is larger. It is the third largest city on the island of Ireland, as Belfast is also larger. People from Cork are called Corkonians. It was founded by Saint Finbarr in the sixth century. 274,000 people live in Cork city and the surrounding urban areas. The River Lee runs through Cork city. 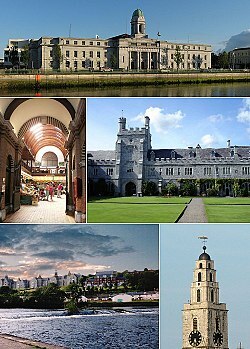 Famous things in Cork City include Saint Fin Barre's Cathedral, Shandon cathedral, Blackrock castle, Fota wildlife park, Fota house and gardens, and University College Cork. Many famous sports people come from Cork including Roy Keane, Dennis Irwin and Christy Ring. Olympic medal winner Sonia O'Sullivan comes from the town of Cobh just outside Cork city in County Cork. EU Capital of Culture in 2005. ↑ "Cork City Council > Cork's Cultural Heritage". Corkcity.ie. Retrieved 2010-08-12. This page was last changed on 12 September 2018, at 02:04.